There are so many things that have happened since the live eviction show on CBS last night and this Big Brother 2014 house could get more and more intense as this week progresses! It looks like more and more HGs might be getting smart and they are onto the Bomb Squad (like Joey suggested last night) and are sick of Caleb and Devin calling the shots! This could be great for Big Brother 16! Check out the highlights from yesterday in our Big Brother 2014 spoilers below! Amber may be HoH, but she doesn’t want to be! She wanted the picture from her family, but she does not want blood on her hands and Caleb and Devin are calling this shots for her. Before nominees announced, Devin went around and told the HGs that they were going to nominated (breaking of the rules), but no penalties given to him! The main target for the week is Brittany, as Devin is threatened by her. He got Paola to agree to throw the Battle of the Block and Paola would be safe for the week. The Battle of the Block competition for Week 2 was already held and the winners determined! Cody is fired up after losing the HoH title from a foul. He is sick of Caleb and Devin calling the shots and it looks like we may have a good piece of action brewing! He talks with Zach and Christine (love her) and they want Paola to go over Brittany because then Caleb and Devin would lose their pawn every week on Big Brother 16! Derrick joins in the mix and they speak of adding in Hayden, Nicole and Jocasta and this could be some good stuff. Paola throws a competition (not that she is good at them anyway) and expects safety because of the muscle heads. I am praying for this (with the help of Bow Tie) because Devin will be an absolute mess (and a joy for the Feedsters) and a joy to watch! Productions keeps sending out these messages similar to the Greek Week theme, which will probably be used for the Veto Competition. They are loud and annoying and no one is getting any sleep! We should have a quiet day ahead of us, as we wait for the Veto Competition (probably Saturday), so I hope everyone has an amazing 4th of July and eat a ton of food, drink a beer and watch the fireworks! 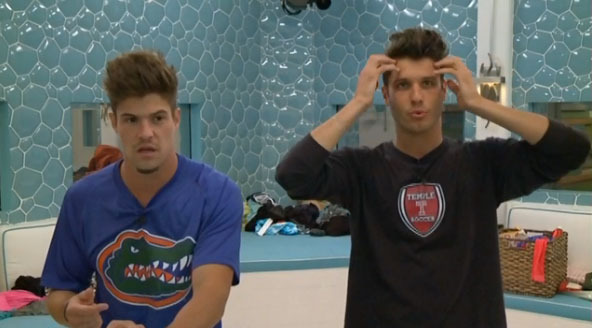 I hope that I do not have to endure watching the arrogant Mr. Caleb and Mr. Devin all season long! Oh my goodness…NO!!! I think a week of Devin as HoH added onto his craziness already and the HGs will gladly kick him to the curb next week! I’m hoping Donny decides to keep his TA appointment to himself. If he spills the beans to Devin it might seal his fate. Devin couldn’t possibly keep the secret to himself. Unless of course it benefited him in some way. Which would mean he’s using Donny again. I would hate to see that happen. Donny is a bit too trusting in Devin. Donny is a sweet, decent person, so he has no idea how to lie, cheat or play a deceitful game. Unfortunately, his honesty will be his downfall. every one of my posts are GONE! Fingers are crossed that you’re right Todd! I was totally disgusted last night when Devin declared no one could discuss game except on comp days. WTH! Talk about a dictatorship! Fortunately i think this sent the other house guests over the edge in terms of staging a coup. I’m willing to put up with Devins antics this week because when the overthrow comes…..it will be all the sweeter. Hee, hee, hee…I like the way you think Cat! And Todd, I sure hope you’re right for the sake of my sanity! Once again another attempt by bb to shake up the game and you’ve got one hoh ceding power to the other and another person throwing a botb comp!! It will be a good tool later but if they revert to the normal system mid season and all this was another bust. I am pleasantly surprised to see Cody zach and Christine cavorting together – as long as they have the courage for a coup!! I’ve thought about this. It’s not so much a failure of an attempt to update the game as it is of choosing house guests that are weak. This twist could totally work if we didn’t have house guests that succumb to fear and intimidation. Strong strategic players is what we need. Eventually they will have to resort to the old system. There won’t be enough house guests for nominations. I’m thinking once they get down to 8 (half the hgs) we will see that return. Of course i could be wrong and they will come up with some other half-a$$ed twist. Yea these twists only seem to be in play early on the season when they are still picking off the easy targets and voting together. Later, when a bold person could use the help the twists all go away. Happened last year. The twists thus year really could shake things up but no one will take any risks this early. I don’t see the TA thing changing the game. They can win $5000 if they do our bidding. But i’m guessing it will be something more along the lines of pure entertainment rather than changing the game up. When it comes to BB, i’m a purist at heart. I like strategy…not twists….to lead me through the game. And right now no one seems to have one. Other than letting a loose cannon play their game for them. Agreed. All I’m saying is these twists (double HOHs and BOTB) are not changing the game these first few weeks. I can see their benefit later, but – as you said – they will have to stop at least at mid-way because they won’t have enough HGs. Why can’t they start the game normally and then pull some powers out later that will give courage to the Christines or Codys to DO something big with it? Like the hidden immunity idol with special powers but they gave them no clues. Geez, it’s week 2 and i’m already hoping someone will throw caution to the wind and make a power move. Maybe they will once things get going but they’ve forgotten that the game starts the minute you enter the house. Someone described Frankie this morning as the next “Andy” (going from room to room and in on all conversations). I suppose if you look at it that way the shoe fits. But he does it with much more finesse. His tactics are not as obvious. Can’t say as he has any better skilled players to deal with than Andy did. But at least they’re not using such derogatory language towards each other. Although i would have to exclude Zach from that statement. His hatred of Victoria seems to know no bounds. Yea, but so far I would not categorize Frankie as a “Rat”. There was something completely underhanded about how the Rat went from room to room last year befriending everyone just to tattle to the other side of the house what he knew. Frankie is sincerely befriending everyone, yes, but he is gleaning information for himself. And for people he sees as his allies so far. He is doing more listening and processing so he can use it to his advantage later. I see him as making moves himself eventually. Last season, the Rat’s strategy WAS to undermine one side of the house by befriending them (Helen, Elise) and then reporting their strategy to the other side – all the while making himself out to be the good guy. He never actually DID anything himself. Of course, my assessment could change later! I really don’t understand why players do that year after year, let someone control them. Loose cannon…good word Cat and describes Devin to a tee. I think everyone’s strategy (except the muscle heads every year) is to do whatever it takes to stay OFF the block until they get a grasp on what everyone else is doing. This is true. But if you start out playing weak, your weaknesses are pounced on immediately. And exploited. Then you only have yourself to blame. I agree that’s bad play. And boring to watch. But it appears to be what everyone does the first few weeks. If this bunch doesn’t join in to remove Devin and Caleb, they are wusses who will be picked off one by one. Just another attempt to post . It will be wiped out soon for sure. I think it is because I am using Apple hardware and software. Your post is still here so hopefully your problem has been resolved. I’ve set my alarm to watch After Dark which starts at 4:00 a.m. I really need to get a life eh? hahaha! My true blue bb fans! You’re awesome! It’s 11 pm to 1 am here so I’ll be up with you! Ohhh my gosh, too funny. Maybe BB 15 pizza man will deliver it. I may actually pop some popcorn! Live Feeds: Donny: yall can’t kick me out the 12th through the 18th cuz I ain’t got nobody to pick me up from the airport. Donny: I’m glad my ears are behind my mouth. OMG,I love me some Donny. Question: is devin ever NOT talking??!? He can be quiet in the larger group, apparently, but when he’s “strategizing” or “counseling” people one-on-one, he just talks in one long sentence like he’s afraid to take a breath or the other person might have a thought and express it! The thing is Lilly, he is always strategizing and/or counseling, he just never shut up, he is in love with the sound of his voice, it’s just too much. I can’t take it any more. Totally agree. I’ve heard so many people talk about getting Devin out next week. Just a matter if anyone has the courage to DO something about it! As I see it, they don’t have a choice they just have to find the courage to get that rambling bully out of the house next week. The tone of Devin’s voice is beginning to feel like fingernails on a chalkboard now. And I agree – he just won’t use one word where 16 can be used…. Omg yes! He actually sounds like he likes listening to himself talk. And. Like. Can. We. Find. Like. Another. Annoying. Like. Word. To. Insert. Every other. Like. Word? I guess I shouldn’t complain. He could be using the f-bomb every other word! LOVING watching a group of silent people stare at fireworks on a tv screen we aren’t allowed to see. Good plan BB….